Today’s video explores a rather loaded subject – how to improvise chords for pop music. This is basically the ability to go online, find a lead sheet or lyrics/chords, and then improvise – make up – your own version without music. This is a skill that needs to be built up in layers. Today we’re going to start from scratch, assuming you know basics about chords, such as how to play major and minor chords with a bit of thought. I’ll continue adding videos to this little mini-series as time passes. 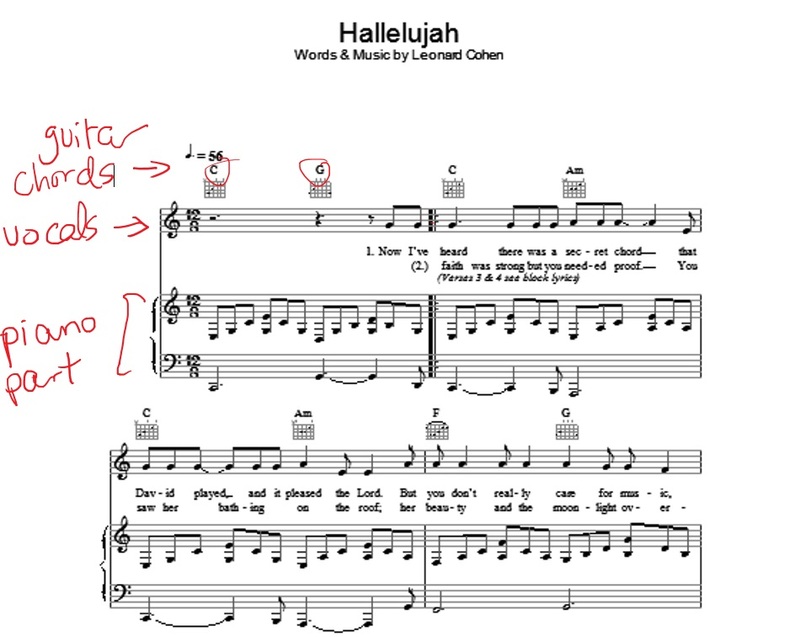 For our first example, I’ve pulled out a page of sheet music by Leonard Cohen, his very famous and lovely Hallelujah. You’ll see the way this page is written includes multiple instrument parts. You have the vocal line, which corresponds to the lyrics – it’s the part you would sing. Below that, you have the piano part. This is what you’d play on the piano if someone was singing along. But we’re going to completely ignore that today. And up at the top, you have guitar chords, along with the name of the chords. This is mainly what we’ll be looking at for our first improv attempt. So let’s figure out some of these chords. If you’ve got sheet music at home like this that you want to figure out, I would even just write the chord right on the page if you don’t have them memorized yet. C chord, G, A minor, and F are the main chords of this song – like most pop music, it really only uses a small amount of chords. To build any major chord, we just add the 1st, 3rd and 5th note of the scale. So for a C chord, we would play a C (1st), E (3rd) and G (5th). Okay so now that we’ve got our chords written down, it’s almost time to improvise. We just have one more thing to figure out – the rhythm. 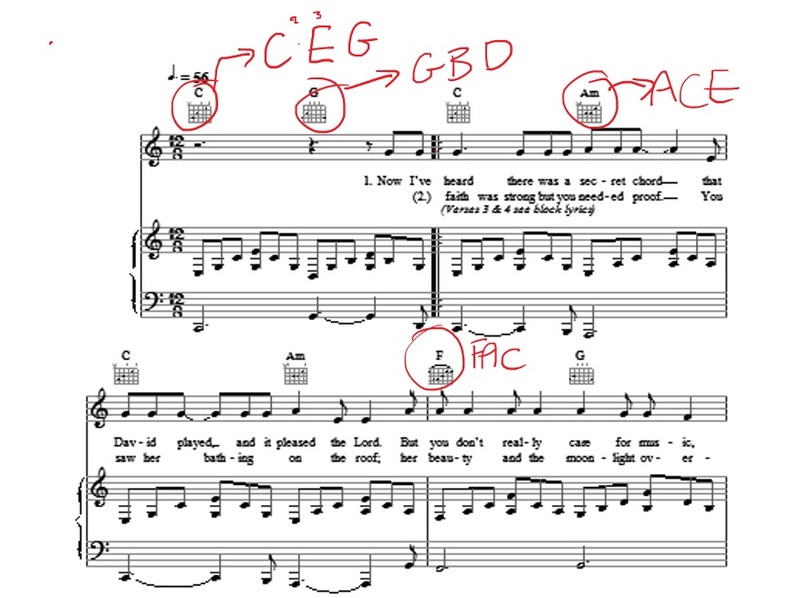 Most pieces you’ll learn are in 4/4 time, but Hallelujah is in 12/8. That means whatever pattern we invent, it has to stick to the rules of 12/8. If we divide 12 in half, we get 6. So in 12/8 time, generally two patterns of 6 notes sound good. Let’s head on over to the piano to figure this out. And that sounds like the pattern in the song, doesn’t it? When in doubt, always listen to the original recording to get a sense of how they use rhythm. What I’m going to do is play that chord pattern in the left hand right now, in our 12/8 rhythm. This means that, based on where the chords are placed in the sheet music, I do each chord pattern once. There are a couple of directions I can go now. I can either play the piano accompaniment only, which means you won’t hear the tune. 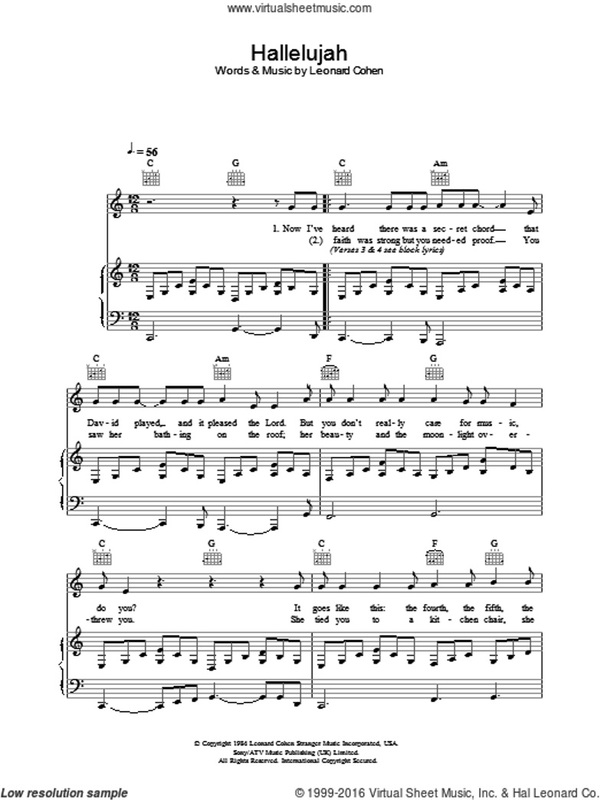 This is ideal if you want to learn how to sing the song, or if someone else is singing. Or, I could play the melody line on the piano. This is ideal if you’re playing the piece as a piano solo, with no singing at all. Let’s take a look at how I might do this as the first option, piano accompaniment only. Well, one easy way to do this is to play the 6-note pattern in the right hand (instead of the left), which leaves my left hand available to play single bass notes. So what I might do is, for each right hand chord pattern, I’ll press the corresponding bass note in the left hand. So if my right hand is doing a C chord pattern, my left hand will be holding a bass C. And when I change to A minor, my left hand will hold an A, and so on. This is really simple, but really effective. It’s a great starting point if you’re trying to sing yourself, since your hands aren’t too busy. The second option is piano solo style. This means that you’ll be playing the melody of the song – the tune – on the piano, as well as doing the background pattern. The easiest way to do this is to play the melody in the right hand, and the harmony (background) in the left. So here my right hand is pretty straight forward – I’m not going to worry about reading the rhythm too much, since I’m playing mostly by sound. I’ll play the chord pattern in my left hand. The most important thing when playing melody and harmony together, is always keep the undercurrent of harmony going. Don’t let this chord pattern get interrupted by the melody. The melody has a tendency to force it’s way in. Say you don’t think you’ve played enough G’s in the first chord pattern – your right hand might interrupt the left hand’s rhythm just to slide another G in, before carrying on. This distorts the flow of the song. It’s better to skip a G, or to play the melody rhythm slightly incorrect, than to interrupt the left hand pattern. At its simplest, that’s really all there is to it. Find an appropriate chord pattern, decide if you’re going to play it with a singer or piano solo-style, and then work your way through it. This is a very no-frills style of improvisation – we’re not talking about fills, or more complicated rhythms – yet. But once you’re able to pick up a song/chords and read them at this level, you’ll then be able to go in and add another layer.